England's Moeen Ali leaves the pitch after being dismissed for a first ball duck. England were routed by Kemar Roach in Barbados, blown away for 77 as 18 wickets fell on day two of a remarkable first Test against the West Indies. Nostalgia for the halcyon days of Caribbean cricket is equal parts inspiration and burden for the current generation but this was a classic display of fast bowling worthy of its place in the pantheon. England's Ben Stokes celebrates taking the wicket of West Indies' Shai Hope during the Windies second innings. England, memorably skittled for 46 in Trinidad in 1994 and 51 in Jamaica a decade ago, added a third famous collapse on these islands as they tumbled to the lowest ever Test total at the storied Kensington Oval. The hosts declined to enforce the follow-on and ended the day 339 ahead on 127-6 after Ben Stokes and Moeen Ali led a spirited but seemingly forlorn fightback with the ball. Ten months have passed since England’s last batting debacle, 58 all out in New Zealand, and although six of the team have changed since that humiliation the fragility of a batting line-up lauded for its depth was all too familiar. Following in the footsteps of Curtly Ambrose at Port-of-Spain and Jerome Taylor at Kingston, Roach played the role of destroyer with figures of 5-17. Roaring in from the Joel Garner End with considerably more ferocity than the speed gun gave him credit for – 85mph was his top recorded pace – he wiped out Rory Burns, Jonny Bairstow, Stokes, Jos Buttler and Moeen in a glorious spell after lunch. 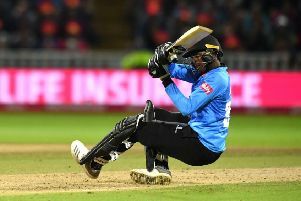 After an exploratory stint with the new ball, the 30-year-old’s second burst saw him wreak havoc across eight overs – with each of his wickets concentrated in the space of 27 deliveries. England had emerged for the afternoon on 30-1, Keaton Jennings the man to go after spraying Jason Holder to gully. Jennings’ continued struggles against seam are a lingering concern but it would not be long before his team-mates were looking enviously at his 17 runs, incredibly the top score of the innings. Burns added only two before he pushed forward at his first ball after the restart, allowing it to skim off the bat and into off stump, and Bairstow was next to succumb to one that spat off a length, grazed his elbow and dislodged the bails. Holder chipped in from the other end to remove rival captain Joe Root, following up 11 successive dots with a plumb lbw. Roach soon reclaimed the spotlight, revving up to strike with consecutive balls. Stokes was given lbw on the back foot, unsuccessfully reviewing a marginal decision, but Moeen’s shot – a curious flap top-edged to fine leg – spoke of a scrambled mind. Roach’s fifth was probably the best of the lot, Jos Buttler forced on to the back foot by a brutish steepler and feathering behind. The paceman’s business was all but concluded but his colleagues finished the job, Shannon Gabriel bouncing out Sam Curran and Alzarri Joseph teasing edges from Ben Foakes and Adil Rashid. Holder opted not to send the shellshocked tourists back in despite a lead of 212, which was built on by a 52-run opening stand between John Campbell and Kraigg Brathwaite. The Windies managed a wobble of their own, losing five for nine once Moeen picked off Brathwaite lbw. The day had started with England taking the last two first-innings wickets for 25.